Is yours a socially productive place? 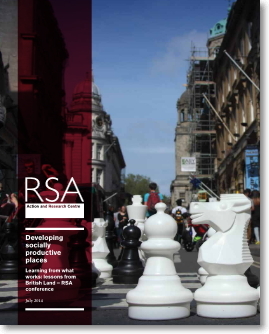 Today sees the launch of a new RSA report, generously sponsored and in collaboration with British Land – Socially productive places – Learning from what works: lessons from British Land – born out of an earlier RSA conference. The report is a long letter to developers, communities and planners, essentially pleading the case that ‘…long term property value is driven by the long term economic relevance of an asset’. A socially productive place would build community capacity to benefit from and drive growth, and increase resilience to shocks and give an ability to adapt to new circumstances. This is not a new idea. The evidence in the report tracks community development progressive initiatives from early EU regional funding to the New Deal for Communities. What is new, perhaps, is the tight focus on new skill acquisition by all partners and a fresh focus on method and delivery for impact. 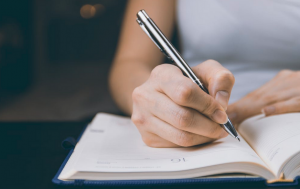 The same refocus is taking place in the community finance sector, where the ‘impact investor’ and how outcomes are mapped and delivered is a priority for funders, project planners and community partnerships. The report exercises this viewpoint well. (As an example of this new social finance mode of delivery see how Social Enterprise East Midlands worked in collaboration with Big Society Capital to deliver an informative and effective mapping session for politicians, social bankers and financial intermediaries in this new sector. See more here…Ed.). The RSA Report also shows how private capital is developing both it’s land bank and its ideas with impact in mind. The report references brands such as Asda ‘... adopting a ‘community venturing’ approach, forming partnerships with charities and public services‘. Discover more about shopping for shared value and community venturing in a recent edition of Matthew Taylor’s blog – read more here. Planning should be thought of as a front-line service. The success of a development should be judged by its impact on those who use it and its ability to contribute to a broader set of social and economic outcomes, the report declares. Building high quality public realm is expensive, but, says the report, privatising public space is not the answer. Accessible public realm is an important feature of social productivity places – places designed to support social and economic connectivity. When built, the people must come. Successful community investment takes time and effort by developers, including long term consistent representation, engagement by senior executives and dedicated staff. Local political support is essential, site specific planning frameworks are not. The results for developers can be profitable as quality of public realm drives rents, and local consent for density allows greater floorspace yield from a site. One of our own sub-regional cities features in the report too. Cambridge, which quietly broke out of green-belt constraints in the 1990’s, created new communities and growth areas. These well designed and built communites, although having offered an increase in take up of local services were less successful, the report indicates, in increasing employment in those new communities. They have, however, increased pressure on transport links. social and economic development thinking, the report highlights. Working with both universities and developers to pursue this goal should be a strategic priority for the future. Certainly a key development driver for Cambridge, being the world class research nexus that it is. Finally, the report gives readers examples of non-linear, non -traditional development models which utilise public spaces for community benefit in innovative ways. One such featured is Incredible Edible – whose growth has been achieved by by-passing bureaucratic processes, ‘…which rely on a narrow account of how value is created and maintained’. In summary, this is an important paper, which whilst containing no ravishing new insights or philosophy, should score very, very highly with the community development sector in the way that it brings together, in a new meld, a variety of distinct skill sets to map a new way forward for developers, planners, politicians and community groups. You can still find the content of the original conference, and the papers presented by a list of distinguished speakers here, on The RSA web site.